The expertise and professionalism of Haugland Brothers tile cleaning services will make your home or business glow, as we offer the most thorough cleaning in the Chicago area. Be prepared to be amazed at how fresh and new your tile will look once we get a hold of them. We have the experience demanded to handle the complex job of thoroughly cleaning tiles and tile grout. Call Haugland Brothers Carpet & Floor Care today to schedule your tile cleaning. The results will amaze you as the colors once again pop out and the stains on the grout disappear. Your home or business will be forever altered by a clean appearance and fresh look. The expert tile cleaning services of Haugland Brothers Carpet & Floor Care extend to all of Hinsdale and surrounding areas. Based in the Chicago area, we have had the privilege of working in hundreds of homes and offices within the city and its outlying suburbs. It is our precise attention to even the tiniest details that have made us a trusted name in our competitive industry. Haugland Brothers is able to provide our valued customers with a tile cleaning service that provides real value. Replacing or repairing tiles and grout is an expensive and time consuming process. With our professional tile cleaning service, you can avoid that hassle and have your spaces restored to good as new. Floor Tile Cleaning That Makes Your Floor Tiles Pop With Color! Ceramic tile has become a popular choice in both homes and businesses for its clean look and easy maintenance. Trouble is, as individuals walk across this surface, tiles soon lose their luster. Professional tile floor cleaning with bring back that initial look your tile once had. Tile Grout Cleaning For a Fresh New Look! Whether on your shower wall, or in your foyer, ceramic tiles are held together with a specialized grout. 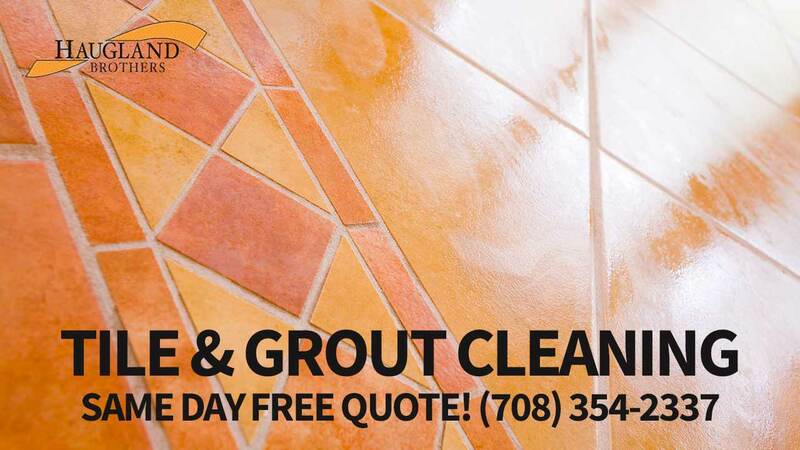 This grout stains and discolors over time, destroying the look of your gorgeous tile work. Restore the original appeal of ceramic tile with a grout deep clean, including restoration and protection that will make it appear as if newly installed. Rid your home or business of grimy grout with a deep clean that only Haugland Brothers can deliver. Why Should You Have Your Tiles Cleaned Professionally? Ceramic tile may look and feel perfectly smooth, but it is full of small grooves that over time collect particles of dirt. Not to mention the staining that occurs to the grout that holds it all together. Since tiles are typically not coated with a protective layer the way stone flooring is, it is more susceptible to losing its luster sooner. Haugland Brothers uses a specialized cleaning product and high powered machinery to emulsify the ground in dirt and wash away any staining. The end result is tiles that electrify the room with their bright colors and clean appearance. How Often Should You Have Your Tiles and Grout Cleaned? Different areas of your home or office will have different needs. Tile work in the bathroom tends to necessitate heavy duty grout cleaning more often, while floor tiles in high traffic areas are prone to losing luster quickly. In bathroom areas, look for signs of grout staining to let you know when its time for Haugland Brothers to make a call. It is best to have your tiled floor cleaned at least twice a year. This will keep dirt from accumulating and destroying the bright, fresh look that your tiles should shine with. With our quick and efficient service, there is never any inconvenience to your home or office. We prepare, clean, and restore the area quickly, leaving behind a floor that looks recently installed. What Can You Do to Protect Tiles in Between Professional Cleanings? Regular sweeping and mopping of a tile floor will help to keep it clean, but remember to avoid cleaners that can cause damage or stain the grout. Also, while the surface of the tiles are being cleaned, there is little you can do alone to avoid grime and dirt from entering the small grooves. Tiles do not need any special coatings to protect the surface, but you can apply grout protection along the lines. These will offer the grout some protection from staining in between your professional cleanings, but will not replace the need to have them done. How Important is Grout Cleaning? Particularly in the bathroom area, dirty grout poses a real health hazard. As a porous surface, it is the perfect environment for mold spores to grow and multiply. These spores can infect your home and destroy the quality of your breathing air. Professional tile cleaning done by Haugland Brothers will effectively remove those spores and protect your indoor environment. Revitalize the color of your tiles with the expert cleaning services that our company provides! We are the number one tile cleaning company in the Chicago area when it comes to restoring your home or office to its shining glory! Call us today at (708) 354-2337!